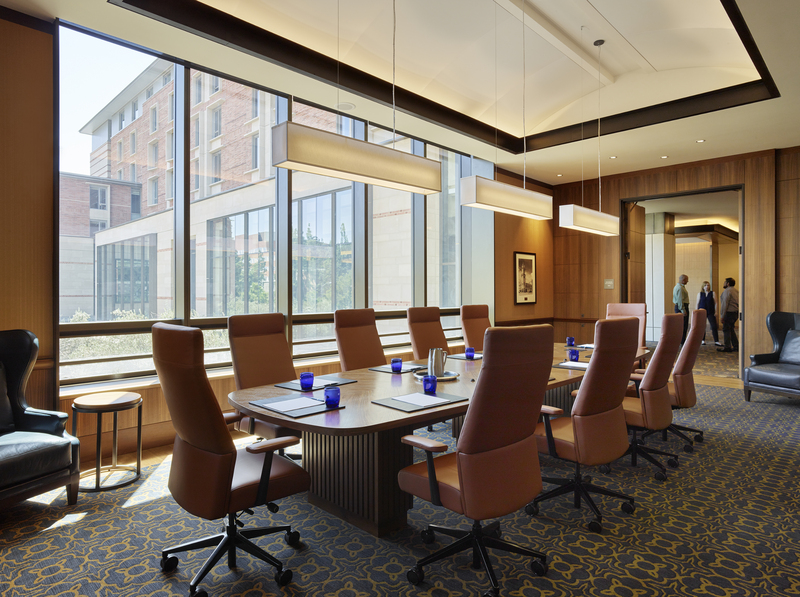 The recently opened University of California Los Angeles' Meyer and Renee Luskin Conference Center (UCLA Luskin Conference Center) sets a new standard for conference centers and hotels, not just in a campus setting, but for the hospitality industry as a whole. Last year, the $162 million building earned LEED® Platinum certification and is considered one of the most sustainable hotels in the United States. Supporting UCLA Luskin Conference Center's sustainability goals, acoustic performance and access to natural light were key contributors. Windows dominate the conference center's lobby and meeting rooms, flooding the interior with sunshine. Wausau Window and Wall Systems provided high-performance windows, terrace doors and a curtainwall to help manage exterior noise and interior comfort, while contributing to the building's overall energy efficiency. The UCLA campus itself is located in Westwood, California, and is close to another project featuring Wausau's window systems – the J. Paul Getty Museum. Situated in the heart of the UCLA campus, the Luskin Conference Center is steps from the Ronald Reagan UCLA Medical Center, the UCLA Athletics Hall of Fame, the Central Ticket Office and Pauley Pavilion, where Bruin athletes compete in basketball, volleyball and gymnastics. 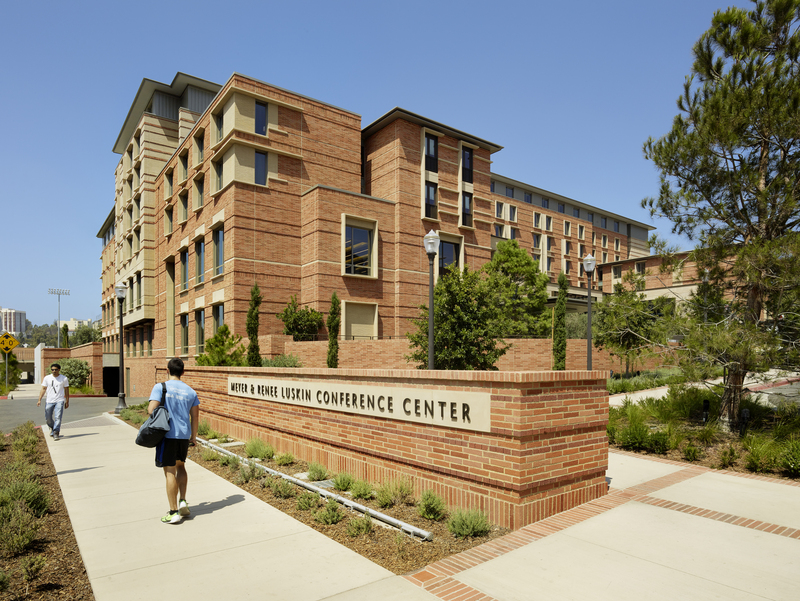 No tuition dollars or state funding were used to build the UCLA Luskin Conference Center. The facility was privately funded, utilizing $40 million from UCLA graduates and sustainability advocates Meyer and Renee Luskin, and $112 million in long-term financing. At the conference center's opening ceremony, UCLA Executive Vice Chancellor and Provost Scott Waugh said the Luskin's gift was truly transformative for UCLA: "What Meyer and Renee are doing here is creating a new heart, a new focal point of UCLA. It will be our gateway to the world." UCLA's motto, "fiat lux," translates from Latin as "let there be light," providing a source of inspiration for the UCLA Luskin Conference Center. "It's all about the light," agreed UCLA Chief Sustainability Officer Nurit Katz. "In this place, there is no compromise between sustainability and beauty," added Magali Delmas, UCLA faculty member and environmental economist. Although windows dominate the lobby and meeting rooms in the new building, flooding the interior with sunshine, Katz also was quick to point out that the bright interior is more than an architectural feature. She noted, "Maximizing the use of natural light also reduces energy consumption." When the conference center's staff and guests can rely more on daylight than on electric lighting, this directly reduces the building's energy consumption. The high thermal performance of Wausau's windows, doors and curtainwall systems further support this goal. Construction of the entire project spanned three years, beginning in August 2013, topping out in November 2014 and completing on time in August 2016. Though open since August, the official grand opening was held in October 2016. The building's LEED Platinum certification was awarded in June 2017. General contractor Morley Builders kept the project on schedule. Working closely with them, glazing contractor Perfection Glass Company installed nearly 10,000 square feet of Wausau's SuperWall™ curtainwall on the entry side of the UCLA Luskin Conference Center. Integrated within the curtainwall are more than a dozen 4250-Z Series zero-sightline, screened awning vents and four roof access casements. In addition to the curtainwall, Perfection Glass installed more than 300 units of Wausau's 4250i-OS INvent™ Series offset windows and 20 units of TD-4250i Series project-in terrace doors with Juliet rails. All of Wausau's products used on the UCLA Luskin Conference Center also are listed in the National Fenestration Ratings Council (NFRC) Certified Products Directory. As a global leader in delivering energy and related performance ratings and certification for fenestration products and systems, the NFRC approved Wausau as a Manufacturer Approved Calculation Entity Organization under the Component Modeling Approach (CMA) Certification Program. Using the CMA software tool (CMAST) Wausau can generate code-mandated CMA Bid Certificates and Label Certificates for the framing systems. The CMAST Bid Certificate ensures responsive and accurate thermal performance verification on a project-to-project basis. 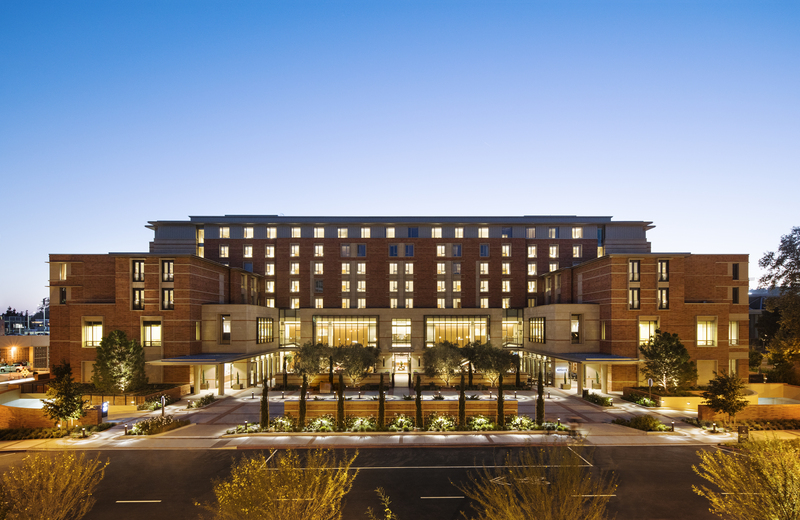 Through NFRC's CMAST libraries of approved frames, glass and spacer components, Wausau's engineering team configured its products for the UCLA Luskin Conference Center, and obtained a U-factor, solar heat gain coefficient and visible transmittance rating. Performance values are then compared to the energy requirements of California's Energy Code to confirm compliance. Validating the performance and appearance of these systems, Wausau provided a full-scale mock-up that was assembled by Perfection Glass. This step allowed for cost-effective adjustments prior to Wausau manufacturing all of the systems as ordered, and ensured the final systems met the required specifications and intended architectural vision. Supporting the project's sustainability goals, standard LEED documentation also was provided showing the aluminum used to produce Wausau's curtainwall, terrace doors and window systems was a high recycled-content aluminum billet composition. 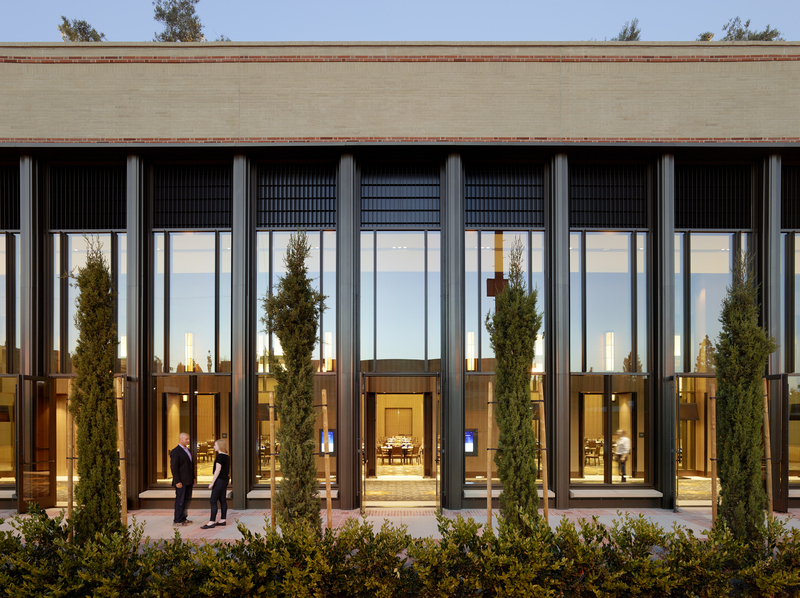 For a uniform look on the UCLA Luskin Conference Center, the terrace doors and windows have matching 4.5-inch-deep aluminum framing members. Adding to the building's distinctive appearance, the windows' glass pane is recessed 1.25 inches from the exterior face and complemented with custom, aluminum panning profiles. Accentuating and protecting the window, door and curtainwall systems, Linetec finished the aluminum framing members and panning in a bronze color tones. The metallic finishes were applied using a Valspar's Fluropon Classic® II three-coat, 70 percent PVDF resin-based mica coating. These coatings meet the industry's stringent requirements set by the American Architectural Manufacturers Association, AAMA 2605, which involves withstanding more than 4,000 hours of salt spray and humidity. Linetec's painted coatings exhibit outstanding resistance to humidity, color change, chalk, gloss loss and chemicals to ensure long lasting, durable finishes. As a recognized, environmentally responsible finisher, Linetec captures the liquid paints' volatile organic compounds (VOCs) content using a 100 percent air capture system and safely destroys the VOCs with a regenerative thermal oxidizer. Linetec then re-uses its heat energy byproduct to improve process energy efficiency. This process of re-use is completed before the material exits the paint line. With the adjacent Pauley Pavilion and close to 46,000 students circulating throughout the UCLA campus grounds, acoustical performance for the UCLA Luskin Conference Center was a priority. The majority of Wausau's systems meet a Sound Transmission Coefficient (STC) of 32, and the windows and doors facing the athletic venue meet a higher STC 35-38. Along with acoustic comfort, guests enjoy a comfortable indoor temperature in the California sun thanks, in part, to Viracon's VNE 13-63 clear Opti-White solar-control, low-e, insulating glass, and Wausau's windows and doors' polyamide thermal barriers. A custom air vent at the top of the windows integrates with the conference center's HVAC system. When the weather allows, the windows' air vents and terrace doors can be opened for natural ventilation. The combination of high thermal performance glass and operable doors also helps to further reduce the building's HVAC load and associated energy use. Promoting comfort and access for all, the conference center is fully compliant with the Americans with Disabilities Act (ADA) requirements. This includes Wausau's casement units, which have ADA hardware. They are tested to meet AAMA 513, opening with less than a 5-pound operating force. 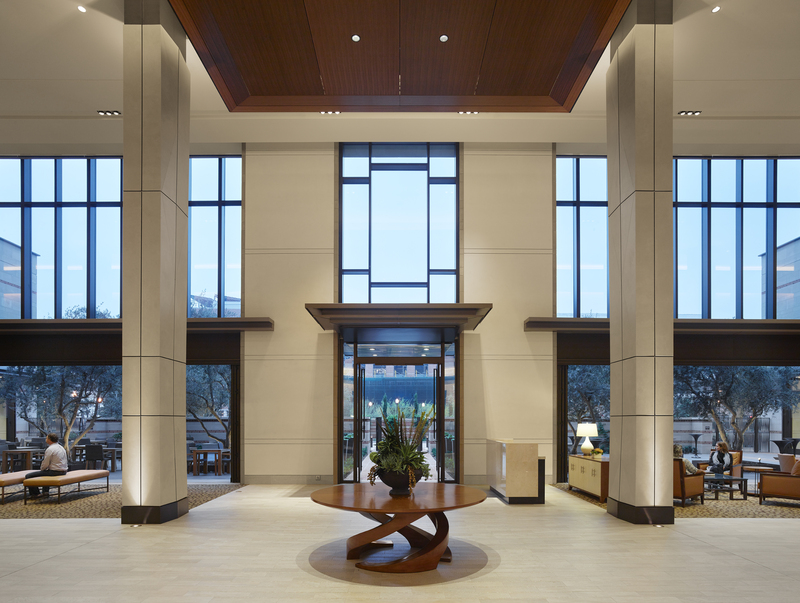 Other accessible building features include entrances and exits, guest rooms, meeting spaces, parking area, lobby, service counters, restaurant and bathrooms. In additional to the UCLA Luskin Conference Center's energy-efficient, high-performance windows, many other components of the building's construction were designed for maximum sustainability: the landscaping is drought-tolerant; many of the building materials came from recyclable and renewable resources, including 92 percent of the steel framing and 50 percent of the wood used throughout. The building also strives to be a zero-waste facility. UCLA Luskin Conference Center's many green building achievements have earned it a recognized place as California's second LEED Platinum certified building of its kind, and the sixth newly constructed venue of its kind in the nation to be certified LEED Platinum by the U.S. Green Building Council. Sustainability, indoor environmental quality, innovation in design, and energy and atmosphere were listed among the building's highest performing strengths. "I'm tremendously proud to work for an institution that prioritizes the importance of sustainability and to have endeavored on this project with donors and professionals that shared those values," said UCLA Assistant Vice Chancellor of Housing and Hospitality Services, Peter Angelis, after receiving the awards. "The design team did everything possible to incorporate sustainability in a meaningful way to ensure that this building and operation will leave the smallest environmental impact possible."